The Columbian Ground Squirrel is a common site in mountain campgrounds and often provides great entertainment for children with their games of peek-a-boo. They can be seen standing upright near their holes, calling out to the others. These rodents are a mixed grey colour with their underside being reddish orange. 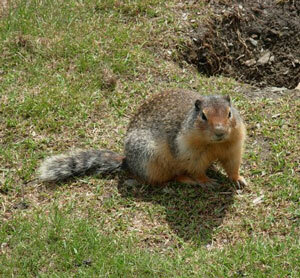 Although the Columbian Ground Squirrel is commonly seen in the montane zone, it is also known to live in areas around the treeline.